A growing number of people in Greater Manchester are signing up to be cancer champions. These are individuals who help spread health messages in their communities to help prevent people getting cancer. 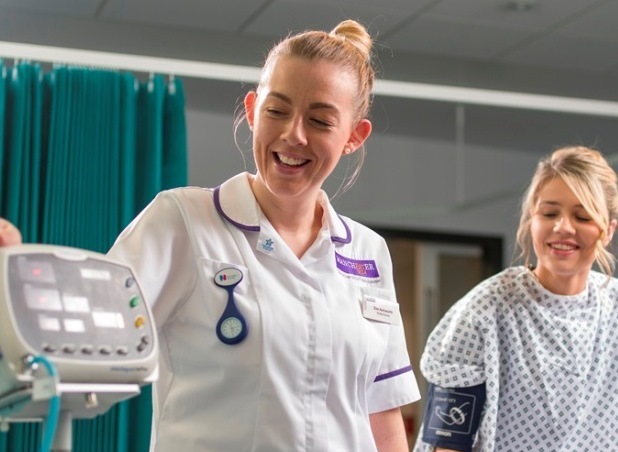 Being a cancer champion is extremely rewarding, as student nurse Zoe Ashworth explains. ‘Hi, my name is Zoe. I’m 30, mum to a beautiful little girl called Esme, and I’m a third-year student nurse at the University of Manchester. ‘I was born in Withington, Manchester, and I live in Stockport now, so I know the area and the community really well. I went to college here, studying art and design for three years. I love everything creative, and still enjoy making things when I can; when I graduated I ended up doing a number of quite varied jobs – I worked in financial services, and even worked for a large car leasing company involved in the selling of cars at auction. Then, when I was 25, I had my daughter. When she was very tiny, just 12 days old, Esme had meningitis. Thankfully, she made a full recovery, and as I watched the way the NHS cared for her, that was when I decided I wanted to become a nurse and have the opportunity of making a difference to peoples’ lives. ‘I’ve always wanted to help people – that’s what drives me – but I used to be quite shy. When I went back to college after having Esme I did some health volunteering on various wards, even in the community, and it was a fantastic experience. I didn’t know anything at all about health at the time. I just wanted to give something back. ‘I really enjoyed it and later became a volunteer for Beating Bowel Cancer, a support and campaigning charity for everyone affected by bowel cancer. They are a great organisation and they gave me further training that really boosted my confidence and gave me lots of great skills that I’ve continued to build on and use. 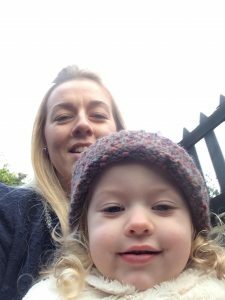 ‘I’m pretty busy with studying and being a mum, so I generally volunteer for Beating Bowel Cancer for about 2-3 hours every couple of weeks, or as often as I can, helping them to promote bowel screening. I’m based at a GP surgery in Stockport. The charity is fantastic and the staff at the practice are lovely and really welcoming. I have a computer, a desk, a phone and a list of people who have been sent their bowel screening kit but haven’t completed it yet. It’s my job to call them up to encourage them to complete and return their kit. I am really interested in people so it’s great to be able to speak with them and try and see what barriers might be holding them back from getting screened. ‘It’s not about preaching to people – that’s not nice and it just doesn’t work anyway. It’s about how you engage with them, seeing things from their point of view and trying to persuade them that this is a test that will help them stay healthier for longer so they can get on with enjoying their lives. Of course, there are times when it’s difficult but actually people are generally quite receptive when it’s a one-on-one conversation. I’ve had some really good chats and some really nice feedback. One patient said, ‘everybody needs a Zoe in their life!’ Another gentleman said the thing he liked most about our chat was that he knew I was genuinely interested in him. Things like that are really lovely to hear and are part of what makes the work so enjoyable. I also won an Impact on Practice award in November 2016 for the work I was doing, talking to patients who were at risk from substance abuse, which was amazing and totally unexpected! I have also recently been shortlisted for an Inspirational Student of the Year Award at University, which I am thrilled about. ‘The best thing about being a cancer champion, though, is knowing I’m making a difference. We’ve done some analysis as part of the Bowel Cancer Screening Volunteer Project and the outcomes report is higher than optimistically anticipated compared to similar projects. These people are listening and taking on board our discussions and it is having a real impact and screening rates are now starting to increase which is fantastic. The charity has estimated that we are currently saving one life every month. That’s 12 people a year, and when you think about each individual person and the other people who would be affected if that person became seriously ill or passed away – the effect that would have on their family, friends and loved ones – then that one life becomes a much bigger network of people that you’ve helped with just one conversation. Can you imagine how many people we could help if we all saved just one life every month? ‘I decided to become a Greater Manchester Cancer Champion because I’ve seen first-hand that little conversations make a big difference. If we all spoke to each other about how to stay healthy and happy more often, we could improve everyone’s quality of life, including our own. I love being a cancer champion. It’s sociable, it’s fun, you are always learning and it really helps build your skills and confidence. It can even help people get back into work, and I know that some retired volunteers in particular really enjoy it, as it gets them out and about, meeting new people and doing new things. To me it’s all about reciprocity – you really do get so much back from giving. ‘Some people might say it’s easier for me to be a cancer champion because I’m a nurse. I have worked in various placements throughout my studies, I am currently working in the complex discharge services team at Manchester Royal Infirmary. It’s very busy and I have face-to-face interactions with patients every day when I’m carrying out assessments, so it’s the perfect opportunity to talk to them about their health. But the reality is anyone can be a cancer champion. You don’t have to work in health or have any specialist clinical knowledge: you just have to want to help people. Even a 10-minute chat over a cup of tea with a colleague or customer at work, a friend, a neighbour or someone in your family can have an impact.